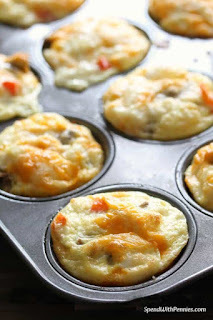 Egg muffins are a delicious and tasty breakfast, naturally low carb and easy to make ahead of time. Brown turkey sausage over medium high until no pink remains. Spray a muffin tin with cooking spray. Divide the red pepper, onion, cooked sausage and cheeses over 12 wells. In a large bowl combine eggs, egg whites and salt & pepper to taste. Pour egg mixture over the sausage in each well. Bake 22-25 minutes or until set. Remove from cups and serve warm or let cool completely and refrigerate or freeze. Microwaves can vary greatly, time may need to be adjusted.